In 1994, during Bill Clinton’s first term, the share of Democrats who identified as liberal and the share who said they were conservative were the same, at 25 percent. Nearly half, or 48 percent, identified as moderate. 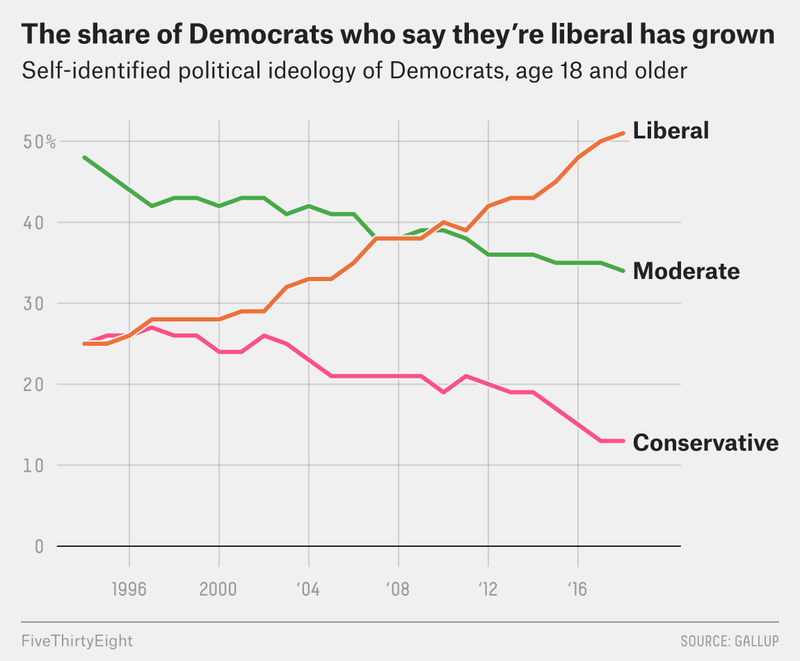 But around 2000, more Democrats began to identify as liberal and fewer as conservative. Gallup found that from 2002 to 2014, the share of Democrats who said they were liberal grew by roughly 1 percentage point each year. Since 2014, the increase has been about 2 points per year, on average. One possible factor in this shift could be the recent rise in the share of Americans who identify as independent, rather than as Republican or Democratic. In 2018, 42 percent of Americans said they were politically independent, the highest number since at least 1951, according to Gallup. It’s possible that some people who had previously identified as either moderate or conservative Democrats are now placing themselves in the “independent” bucket. Overall, however, Gallup found that in 2018, the share of Americans who identified as liberal (26 percent) was smaller than the percentage of those who identified as conservative (35 percent), as well as those who called themselves moderate (35 percent). 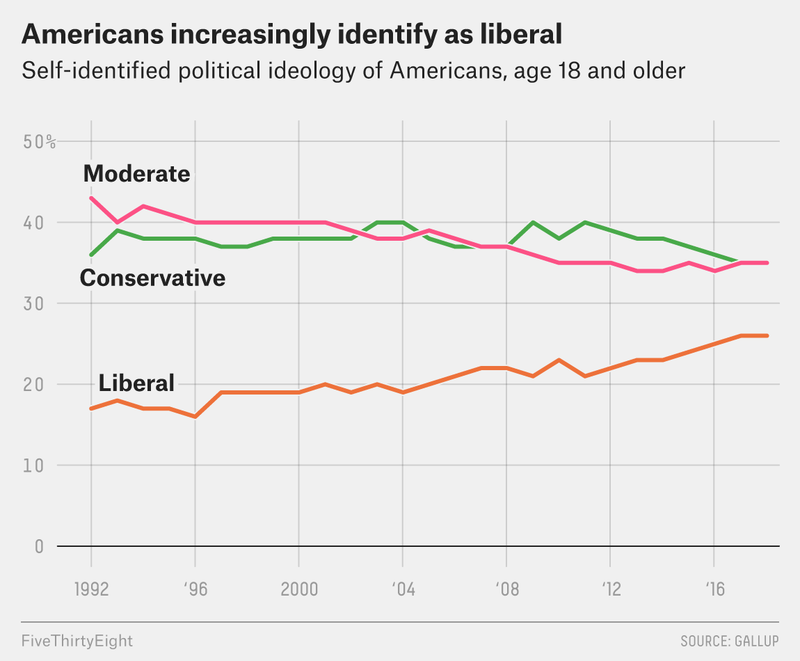 But even among all American adults — as opposed to only Democrats in the chart above — you can still see that the share of liberals is growing, jumping more than 9 points from 1992 to 2018. These trends could influence the type of political candidates and policy issues that appeal to the base of each party going forward. With 2020 fast approaching, we may see more liberal Democratic candidates and policies emerge, but that may prove to be a tough sell in a general election in which Democrats will need to win over some independents and moderates on the left who increasingly find themselves disconnected from the party’s base. The polling news of the week is the ongoing partial government shutdown. A FiveThirtyEight analysis found that Americans increasingly blame President Trump for the partial government shutdown. Recent polls found that 47 percent to 51 percent of Americans blame Trump for the shutdown, while about a third blame congressional Democrats. Morning Consult found that Trump’s net approval rating (approval rating minus disapproval rating) dropped in all 50 states and Washington, D.C., between January 2017, when he was sworn into office, and December 2018. The biggest drops were in New Mexico (36 points), New York (31 points) and D.C. (31 points). Since Trump became president, a record number of Americans have said they want to permanently move to another country — 16 percent in both 2017 and 2018 — according to Gallup. The average share of Americans who wanted to leave the country was 11 percent during the George W. Bush administration and 10 percent when Barack Obama was president. 84 percent of Democrats said that providing health insurance coverage for everyone through a taxpayer-funded national plan should be “an extremely important priority,” according to a Politico/Harvard poll. Thirty-six percent of Americans say they’ve used a ride-hailing service such as Uber or Lyft, up from 15 percent in 2015, according to a 2018 Pew Research Center survey. Of the age groups that Pew reported on, 18- to 29-year-olds were the most likely to have used one of the services. Wealthier and more educated people were also more likely to use them. About 7 in 10 Americans said it was “somewhat” or “very” likely that housing prices would increase in 2019, according to Bloomberg/Morning Consult. The two teamed up to find out what Americans think will happen in the year ahead. Seventy-five percent of Americans said they believed companies will suffer more data breaches, and 67 percent said it was unlikely that crime rates would decline. According to FiveThirtyEight’s presidential approval tracker, 41.0 percent approve of the job Trump is doing as president, while 53.9 percent disapprove (a net approval rating of -12.9 points). 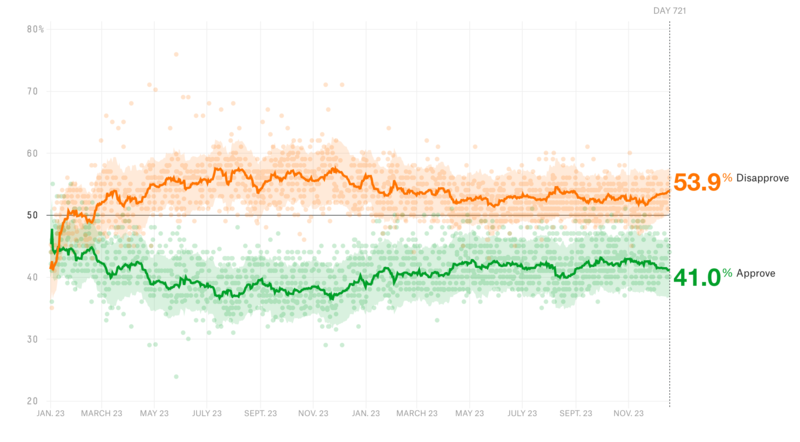 That’s a drop from one week ago when, 41.4 percent of Americans approved and 53.4 percent disapproved of the president (a net approval rating of -12 points). And it’s an even greater decline from one month ago when he had an approval rating of 42.1 percent and a disapproval rating of 52.6 percent, for a net approval rating of -10.5 points.